Make an Impact in Children's Lives. VBS 2019 Is Here. At Concordia Supply we carry the best and highest quality Vacation Bible School programs available. We are your VBS Headquarters for information, ideas, and supplies. 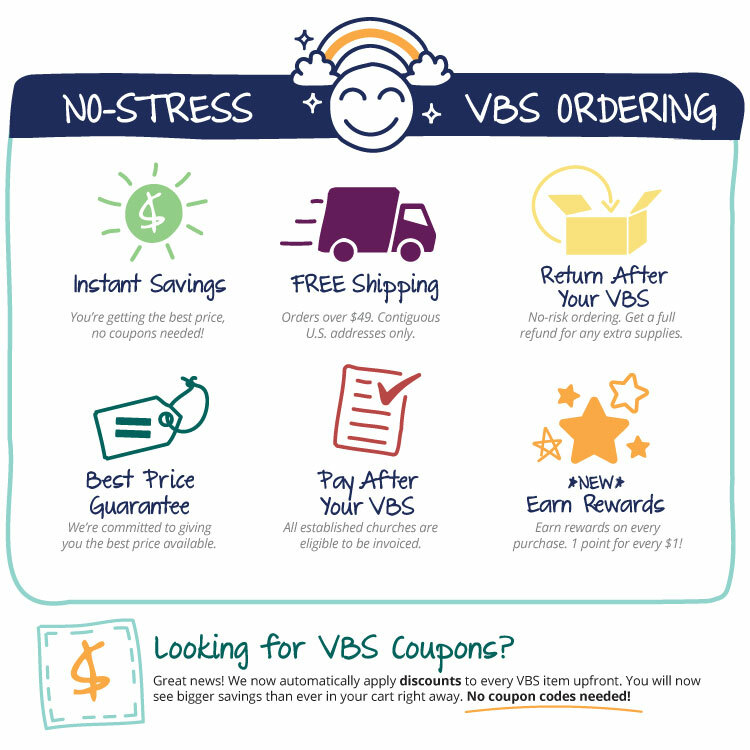 As you get ready for VBS, follow these steps to VBS Success! You can have an even greater impact on your community and we have the tools to support you! Choosing your VBS 2018 theme is the first step to VBS Success. Once you know your theme, order your Starter Kit filled with all of the essential items you'll need to begin planning your event like Leader Manuals, decorating tips, music and sample student items (kit contents vary by course). Follow the path to VBS Success! Custom VBS Banners are one of the best ways to announce your event to your community. All you need to know are your dates and time and you can start publicizing your VBS way ahead of time! Set up your FREE online VBS registration at MyVBS.org. Create an easy custom website in minutes with a unique URL for parents and volunteers to register for your VBS. Build and send e-mails for promotion and follow-up. Make sure you have plenty of items for each student at VBS. Most courses suggest one item per child like the popular Bible Memory Buddies for Shipwrecked VBS student items. Send your students home with lasting keepsakes with Custom VBS T-Shirts. Make an impact with branded t-shirts for as low as $4.99 per shirt. Pricing varies based on shirt quantity and number of ink colors.